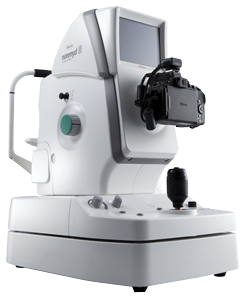 The Nonmyd 8 is a high quality, simple to use non-mydriatic retinal camera built with traditional Kowa reliability. Capture high levels of clinical detail with the sharp and clear images of the latest Nikon® digital camera. A choice of fixation modes offers nine positions including mosaic for extended viewing of the retina. The industry standard USB interface connects to a desktop or laptop PC and the included Portable VK-2 digital imaging software lets you store, view, and compare your images with ease.